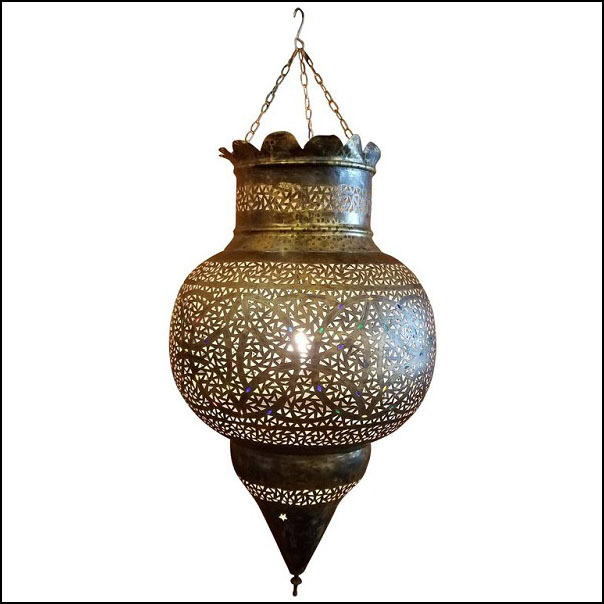 Made from pure copper, these beautiful Moroccan table lamps / lanterns are sure to be show-stoppers anywhere in your home. Each is handmade using ancient artisan methods which consist of puncturing the surface with a unique, elaborate design, so that, with a bulb inside, it casts light in intricate, decorative patterns that will delight you, your family, and your guests. This particular measures approximately 32″ in height (chains included), and 14″ in diameter. Please contact us for a shipping quote, if you have any questions, or for more pictures.